It has become a ritual in Illinois. Every 10 years the state loses a congressional seat or two through redistricting because Illinois' population growth lags the rest of the nation. Incumbent congressmen scramble to hold onto one of the remaining slots. But the 1990 remap brings a new twist to this political game. For the first time, a new player is introduced: Hispanic voting power. A new district has been formed in Chicago, one designed to maximize the possibility of a Hispanic representative to the U.S. House. Note that "to maximize" the possibility" is not the same as "to ensure" a Hispanic representative. Demographics of Chicago Hispanics (particularly the large numbers of underage residents and the great numbers of non-U.S. citizens) plus the dispersed Hispanic population mean that no congressional seat can be drawn "to assure" Hispanic representation. In one respect, such a district is overdue. Illinois' Hispanic population grew 29 percent during the 1980s while the rest of the state lost population. The state's 909,446 Hispanics (by the 1990 census figures) account for 7.9 percent of Illinois' population. In Chicago, particularly, the Hispanic increase was important. Hispanics now comprise 20 percent of the city's population (2,783,726) and, in reality, probably comprise an even greater percentage because Hispanics are believed to have been undercounted in the 1990 census. Illinois, unlike other states with large Hispanic populations, has a diverse Hispanic population. Represented are sizeable populations of the major Hispanic ethnic groups — Mexicans, Puerto Ricans and Cubans — as well as immigrants from every nation in Central and South America. While it can be argued that they don't really fit into one compact district, they received support for one in the mid-1980s from Chicago's political establishment. Hispanic concentrations can be found from Aurora to Waukegan to the Quad Cities, but only Chicago has a large enough number to be considered in a congressional district. And the two major Hispanic areas in Chicago — the near southwest side's Mexican Pilsen, Little Village and Back of the Yards and the near northwest side's mainly Puerto Rican West Town, Humboldt Park and Logan Square — are separated by the virtually all-black west side. Nonetheless, Hispanic leaders pushed hard for a separate district, Ultimately they got it. "When Harold Washington was mayor, he was asked several times in his reelection campaign if he supported a Hispanic congressional district. He always said yes," recalls state Sen. Miguel del Valle (D-5, Chicago), who served as the first chairman on the Mayor's Advisory Committee on Latino Affairs. "The district had been talked about for several years. We were waiting for census data to make sure we had a strong case. When we saw the data, it was certain that there should be such a district." What was certain in del Valle's mind was far from clear to a number of people, namely Chicago congressional incumbents who faced the threat of job loss if a new district was formed to accommodate an outsider. Two districts were to be lost to Illinois incumbents already with 20 instead of 22 districts apportioned to Illinois, and this stalwart band of Chicago incumbents issued a joint statement on March 21 concluding that the city's Hispanic population is not concentrated enough to justify the creation of a new district. ous," adding that the motives of the eight "are so nakedly self-centered as to be embarrassing, even for members of Congress who tend to be immune from embarrassment." The incumbents' statement drew fire from even more important quarters. All four Illinois legislative leaders, who were overseeing the attempts to draw the new congressional map in the legislature, repudiated it. House Speaker Michael J. Madigan D-30, Chicago told the congressmen that he would cooperate with them only if they agreed to a map with three black, one Hispanic and a "Jewish" district. Gov. Jim Edgar also called for a Hispanic district. With a new Hispanic district universally agreed to, one problem remained. 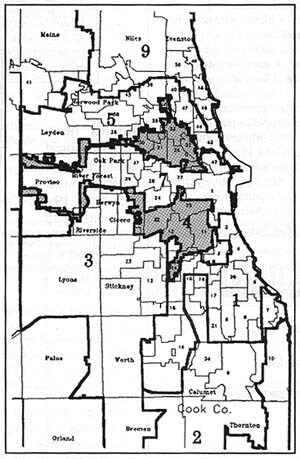 Since congressional districts must be contiguous, the near northwest and near southwest side communities had to be connected. This posed two problems. First was the demographic one. The "connector" had to be narrow enough so as not to dilute the district's overall Hispanic population. Second was the political one. Veteran 7th District Democratic U.S. Rep. Cardiss Collins wanted to protect her turf, which includes both downtown (where she lives) and the west side. Thus the connector became an issue that threatened to split the black and Hispanic communities. An early map proposed by the Illinois Latino Committee for Fair Redistricting put the connector on the district's east side, a one-precinct-wide stretch near to but not adjoining the lakefront. This map created a new district 63 percent Hispanic, 29 percent white and 6 percent black. Collins' 7th District would be 65 percent black (the percentage mandated by the federal Voting Rights Act), 26 percent white and 7 percent Hispanic. It would include some southwest side white precincts that presumably would not be friendly Collins territory. This map was quickly panned. Collins complained because it would cut her district off from the affluent lakefront. State Sen. Ethel Skyles Alexander, representing a south side black district, called it "totally wrong" because it would separate Collins from some of her base. U.S. Rep. Gus Savage, the black congressman from the far south side 2nd district, called it "a gruesome error." The Sun-Times claimed it "resembles two fish swimming in different tanks but nibbling at opposite ends of the same scrawny worm." Meanwhile, a black coalition fronted by then Alderman Danny Davis and former Appellate Judge Eugene Pincham Moated another map. This one made the connector a thread running through the suburbs of Stone Park, Melrose Park, Forest Park and Cicero. This map would create a 61.3 percent Hispanic district. It was deemed unacceptable to Hispanic negotiators, who threatened to go to court against any map that was not at least 63 percent Hispanic. This map, perhaps more than the Hispanic-proposed one, threatened the ever tenuous black-Hispanic Democratic coalition. "A certain element in the black community didn't want success. They wanted guarantees that they would be reelected. There's nothing in the Voting Rights Act to assure that," charged Victor Crown, a consultant who worked for Hispanic groups on early maps. "Collins' insistence on a safe district ruined any chance of a coalition between blacks and Hispanics. She wanted the moon and the stars and everything." The Chicago Urban League proposed a map which again shortchanged Hispanics but left Collins with a 67 percent black district. Mexican-American Legal Defense and Educational Fund (MALDEF) regional counsel Linda Reyna Yanez claimed, "The paramount interest of these [black] maps is not for the communities, but for Collins." The Illinois Latino Committee for Fair Redistricting tried again with a connector that extended between Damen and Western avenues. The 7th District would be scrambled around the south end of the Hispanic district, going south of 51st Street before moving north to cover the Loop. Blacks refused to accept it. Time was running out for the General Assembly, which had to come up with a congressional map before the end of June. Otherwise the ultimate mapmaking decision would go to the courts (and ultimately that is what happened). Illinois Senate President Philip J. Rock, faced with a half-dozen different proposals, failed to act on any of them. Even though the state's three Hispanic legislators. Sen. del Valle and Reps. Miguel Santiago (D-9, Chicago) and Ben Martinez (D-20, Chicago), called for a vote on the congressional district, the Democrats indicated they would not act on any map the incumbents failed to endorse. Such endorsement never came. Without it. Rock let the Senate deadline slip by and no map was passed. With no map from the General Assembly, reapportioning of Illinois' 22 congressional districts into 20 new ones went to U.S. federal court in Chicago. In July the Democrats finally submitted a map which included a Hispanic district. That map's Hispanic district eliminated precincts of mainly black Maywood from Collins' district, giving them to conservative white U.S. Rep. William Lipinski (D-5, Chicago). Collins complained about the Maywood loss, claiming "[The Maywood residents] do not want to be represented by anyone other than their like kind." from Lawrence to 51st Street, going as far west as Belmont and Central on the north and Cicero on the south, with a strip of land between Damen and Western as the connector. Collins' 7th District would encompass the west side and near western suburbs, snake around south as far as 55th Street, then move up to the Loop. Democrats and Republicans finally agreed in October on the placement of the Hispanic district, a month before they came to terms on the rest of the map. The Hispanic district resembled none of the previous endeavors. Numbered the 4th by Republicans, it contains Chicago's two main Hispanic population centers, connected by a barely visible swath that meanders through often uninhabited territory as far west as I-294, allowing deer and raccoons in several forest preserve areas to have Spanish-speaking representation. Hispanic leaders celebrated Chicago's federal district court's November 6 ruling creating the new district. "We are absolutely ecstatic about the court's ruling," said MALDEF's Yanez. "We provided the court with a reasonable plan that would promote the voting rights of [Hispanics] and not adversely affect the rights of the African-American community." Who will represent the hundreds of thousands of Hispanics in this new district? Two of the most visible presences in the Hispanic community, state Sen. del Valle and 22nd Ward Alderman Jesus Garcia, took themselves out of the running early. Del Valle vowed to seek reelection, while Garcia in October announced his candidacy to a new Hispanic majority state Senate seat that will open up on the near southwest side. • Luis Gutierrez, alderman of the near northwest side 26th Ward. No Hispanic politician has more openly craved this job than Gutierrez, who won his present office during a fiery election campaign in 1986. Gutierrez' 1989 switch from independent to backer of Richard M. Daley for mayor assured the favor of Chicago's most powerful politician. Possible support by Daley marks Gutierrez' main advantage over other candidates in the congressional race. But will Daley come out for Gutierrez or, for that matter, any other candidate? If not, Gutierrez may face trouble. Never a favorite of old-line Democrat white committeemen, he may not be able to bank on their support. Independents, still irritated by his shift to Daley, are not certain followers in the Gutierrez camp. It also remains to be seen whether the district's Mexican voters will back Puerto Rican Gutierrez if a Mexican candidate emerges. Mexicans make up a majority of the district's Hispanic population, although Puerto Ricans outnumber them as voters. • Joseph Berrios, commissioner on the Cook County Board of (Property Tax) Appeals. The first Hispanic elected to the General Assembly (in 1983), Berrios left it in 1989 for the security of his present office. The unassuming Berrios has kept a generally low profile. Recognition among Hispanic voters, not to mention the district's many non-Hispanic voters, may be a problem. But unlike Gutierrez, Berrios, who is a protege of former state Sen. Ed Nedza (D-19, Chicago), has always been on good terms with the nearby old-line white ward bosses, many of whom now preside over Hispanic majority wards. Berrios, who lost an election for 31st Ward Democratic committeeman in 1988, most likely would need that ward organization support to have a chance in the congressional race. • Miriam Santos, Chicago city treasurer. Santos, a Puerto Rican and an attorney, replaced Cecil Partee as treasurer when Partee was appointed Cook County state's attorney in 1989. She won a landslide victory in 1991. Her strong showing (she even outpolled Daley) made her a much-rumored candidate for a congressional opening. But Santos' drawing power on her own is uncertain. Could she win a rough-and-tumble election without Daley's coattails and organizational support? Would Daley, who was engaged in a public feud with Santos over her seat on city pension boards, actively oppose her? Santos is also believed to be interested in making a run for Democratic committeeman of the 43rd Ward (located east of the Hispanic district). Since the Hispanic congressional district includes none of the 43rd Ward (unless city ward remappers play amazing tricks), Santos would have to choose between the two possible campaigns. • Juan Soliz, former 25th Ward alderman. Soliz, one of the most visible politicians in the Mexican community, is one of the most popular. A poll conducted by the Midwest Voter Registration and Education Project during the mayoral election showed Soliz as the leading choice among Hispanics. Yet Soliz always had problems with his ward's non-Mexican vote, and the Mexican vote by itself would not be sufficient to win this election. Soliz claims he is primarily interested in his court case challenging last spring's election results in the aldermanic race (Ambrosio Medrano edged him in a close runoff). Soliz is also rumored to be interested in running for judge in a newly formed, Hispanic majority judicial district. • Vilma Colom, attorney and recent Republican candidate for city clerk. On the one hand, she should be able to win the Republican primary. On the other hand, what difference will that make in a predominantly Democratic district? • Any white guy. Even though the new district has been drawn to maximize the possibility of Hispanic representation, that by no means assures Hispanics will be elected to the office. The district contains a 65 percent Hispanic population, but only a 59.2 percent Hispanic voting age population. That percentage is further diluted because many Hispanics are not U.S. citizens and thus ineligible to vote. These factors, plus generally lower voter turnout by Hispanics, may open the doors to an ambitious white candidate. The house of U.S. Rep. Dan Rostenkowski was placed in an early version of the Hispanic district, but the Ways and Means chairman wound up in a northwest side district — the 5th. The most powerful white politician there now is probably Richard Mell, 33rd Ward alderman. "The district has all of my present ward, plus the area I used to represent. I'd have a good chance there," he says. Mell hasn't discounted a run for the House bill claims, "If I ran, I'd be interested in serving only two years." Of course, these are only a few of the possible candidates, a state that has wide-open congressional races about as often as it hosts the World Series and a total solar eclipse, it may be too good an opportunity to refuse. David K. Fremon is a Chicago writer.